To be and have all that you want in life, it’s as easy as 1 2 3. 1) Know that there is a version of you that is happy, loved and abundant and set a goal to move closer to that you. 2) Each day decide on what you want to clear or heal or do to bring you closer to the real you. This list may help you decide on what to work on. When you do this EVERYDAY, you move one step closer to the goals you set. Start small. Work on something you know you can achieve in the period of one month. The blocks you clear to the small goal may also be blocks to bigger goals. And when you’ve accomplished that goal, set another and another and another. The goal isn’t necessarily to get “stuff”. The goal is to get to that YOU that is happy, peaceful, abundant and living your life’s purpose. Do this each and every day of your life and experience tremendous growth and expansion. Imagine what you want or who you truly are as already existing in another dimension. Now think of a tunnel between the current, physical you and the you that has all that you wish for or want to be. 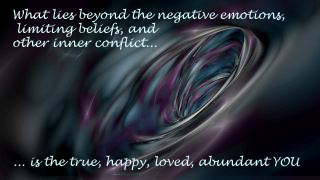 Now imagine the tunnel being full of your negative emotions, your limiting beliefs, and other inner conflicts. To get to that you that has all that you wish for, you have to dig that stuff out of the tunnel! And it's not as hard as you think. Decide each day to look inside the tunnel and see what you can clear. Looking at my list of possible subconscious blocks, you may be able to come up with something to work on and clear. By using my 6-step formula, you can clear one or multiple things each and every day until you reach that peaceful, happy, loved, abundant YOU! Journaling can also help you find the subconscious blocks. As you find them, you clear them and step-by-step, day-by-day, you get closer to the real you. The more you clear these blocks the more you allow. And a side benefit is inner guidance, increased intuition, and spiritual awakening. And if you need help, my Consciousness 101 Program contains a detailed description and instruction on how to use the 6 steps, along with lots of other tools and tips to help you in your transformation.